With a startled shout from the outcrop above, the Hizballah fighter bounded down the rocky slope and cocked his AK-47 rifle in a dramatic flourish as he drew near. "What are you doing here?" he demanded, his face a mix of anger and astonishment. "This is a military zone. You should not be here." It turned out that the youthful militant had been guarding a small outpost created by Shi'ite militia on a remote mountaintop in south Lebanon. The location was well chosen, offering the Hizballah men commanding views over the hills and valleys of the southern Bekaa Valley, a likely battlefront if a widely anticipated  and feared  war breaks out between the Iran-backed group and Israel. Whether these rugged hills will see yet another war depends less on the likely combatants than on the U.S. and Iran. Hizballah is viewed as one component of Iran's deterrence against a possible attack on its nuclear sites, should diplomatic efforts fail to resolve the standoff with the West over its enrichment of uranium. And recent conversations with Hizballah fighters reveal an organization at the peak of its military powers, with an army of well-trained, disciplined and highly motivated combatants wielding advanced weaponry, cultivating new tactics and brimming with confidence. "The next war is coming, 100%, but we don't know when," says Ali, a thickly muscled university student. "We have big plans for it. God willing, you will see the end of Israel." Like all Hizballah fighters interviewed for this article, Ali requested anonymity, as he was not authorized to talk to the press. Although Hizballah and Israel both insist they do not want another war, neither side has disguised its preparations for that possibility. Since the end of its latest bout with the Israeli military, in July and August 2006, Hizballah has built new defensive lines and firing positions, the fighters say, in the hills flanking the Bekaa and along the rugged, mountainous spine running up the middle of southern Lebanon. One such position was the observation post near the town of Jezzine onto which a TIME reporter stumbled. It consisted of a couple of bunkers sunk into the hillside, an open fireplace with a soot-blackened cooking pot and bags of onions and potatoes. Local residents say at night they can hear the sounds of explosions and gunfire echoing through the valleys as Hizballah trains. Israel vows it will use far greater force in the next war and will treat the Lebanese state  in whose government Hizballah has a major role  as the enemy, rather than just the Shi'ite militia, a prospect that frightens many Lebanese. But the resolve of the Hizballah combatants remains unshaken by Israeli threats. "Israel is living in a state of confusion because it perceives that any aggression it would launch against Lebanon would be lost," boasted Hizballah deputy leader Sheik Naim Qassem this week, adding that he did not believe a new war with Israel was on the horizon. Perhaps not, but the look in the eyes of Hizballah's combatants suggest that not only are they fully prepared to fight one, they actually look forward to it. "It doesn't matter. We can always rebuild. Our dignity is more important than roofs over our heads," says Haj Rida, a square-jawed unit commander. Such sangfroid illustrates the single-minded determination of the Hizballah combatant, nurtured by years of relentless religious instruction and military training. Ali, for example, was raised in an environment of Islamic piety and dedication to the cause, joining the party's youth program at the age of 12. He eschews parties and listening to music, saying he has dedicated his life to "walking the path of the Prophet Muhammad." "I have my studies at university and my family, but I also have the life of jihad and preparations for the coming war," he says. "I consider my jihad duties as something joyful. You cannot understand the joy of jihad unless you are in Hizballah." Acting on an internal assessment of its military performance in the 2006 war, Hizballah is seeking to improve its capabilities by developing new tactics and acquiring new weapons. It is placing particular emphasis on improved air-defense systems to challenge Israel's aerial superiority. Reports over the past year suggest that Hizballah has received advanced Russian shoulder-fired antiaircraft missiles, and some fighters have been trained in Syria on larger truck-mounted missile systems. U.S. and Israeli intelligence sources say Hizballah has also augmented its arsenal with larger, longer-range rockets with guidance capabilities. 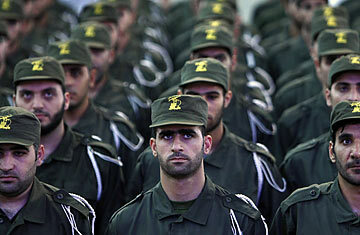 Many analysts believe that in the event of another war, Hizballah plans to strike strategic targets deep inside Israel. In February, movement leader Sheik Hassan Nasrallah hinted that Hizballah now had the ability to strike targets in Tel Aviv. Although last month's Israeli claims that Syria transferred Scud ballistic missiles to Hizballah remain unsubstantiated  and some military analysts are skeptical, given the rocket's size and cumbersome logistical requirements  the group is believed to have acquired Syrian-manufactured M-600 guided rockets. The M-600, a copy of an Iranian rocket, can carry a 1,100-lb. (500 kg) warhead a distance of 155 miles (250 km), and its guidance system allows Hizballah to target Israel's Defense Ministry in Tel Aviv from hidden bases in the northern Bekaa Valley. Hizballah's possession of the M-600 is "just the tip of the iceberg," Brigadier General Yossi Baidatz, Israel's top military intelligence analyst, told a Knesset committee on Tuesday, May 4. "Hizballah currently has an arsenal of thousands of rockets of all kinds and ranges, including solid-fueled rockets, with a longer range and more accurate," he said. Besides seeking new weapons systems, the Shi'ite militia is also finding innovative ways to utilize older armaments, such as the guerrilla-standard RPG-7 grenade launcher and the recoilless rifle, a near obsolete antitank weapon. "The RPG-7 is old but still a good weapon," says Ali. "It's how you use them that counts. We are always studying new combat techniques." Israel's heavily armored tanks are to receive a newly developed defense system that fires mini-interceptors to destroy incoming antitank missiles. Hizballah fighters, without revealing details, say they are training to overcome such sophisticated defenses by "swarming" Israeli tanks with low-tech antitank weapons. Hizballah's battle plans may also include having fighters infiltrate Israel to carry out raids and sabotage missions  a move that would be unprecedented in the Arab-Israeli conflict. Israeli doctrine is to fight its wars in the territory of its enemies rather than on its home front. Says Ali: "God willing, we will go into Palestine next time." Despite the mounting tension, Israel's pledge  and vast capability  to inflict catastrophic damage on Lebanon and the scale of Hizballah's arms buildup functions as a kind of mutual deterrence that has brought the usually volatile frontier its longest period of calm in 40 years. Watch TIME's video "Israel's Lonesome Doves."